Every year when I file my taxes, I’m reminded about how much of my income goes towards running the government. A little over 25% of my total income goes towards income taxes, social security taxes, Medicare, and other programs. Over time, I’ve picked up several strategies that have allowed me to amass a large net worth while either paying no taxes on my gains or only paying taxes when I finally withdraw my investments. Looking back, I wish someone had told me about all of these strategies when I first started working so I could have implemented them earlier. I wanted to share these 5 steps that I’ve learned so you too can take advantage of these strategies. If there are any others that you know, please share them in the comments. As a note, I wrote this short guide for people who work for companies and have access to programs like a 401K. Even if you don’t work for a company, this content can still be relevant. For instance, if you work for the government, you’ll have access to a Thrift Savings Plan, which is equivalent to a 401K. Additionally, this article is for people who live and work in the United States. As a first step, you should absolutely max out your 401K. You can contribute up to $18K/year and you should contribute the full amount. The company I work for is quite generous and they match 50% of your contributions and vesting is immediate. This serves as an incentive to max out my contribution. The earlier I max out in the year, the sooner I have access to the $9K matching. I contribute all of the money pre-tax, so I only pay taxes when I eventually withdraw the money. If you make less than $116K, you can contribute $5.5K directly into a Roth IRA. You pay taxes up front and you never have to pay taxes again on any of the growth. If you make more than $116K, you can contribute $5.5K to a traditional IRA and then convert it into a Roth IRA. It’s a backdoor way to skirt around the income restrictions allowing you to still contribute the full amount to your Roth IRA. 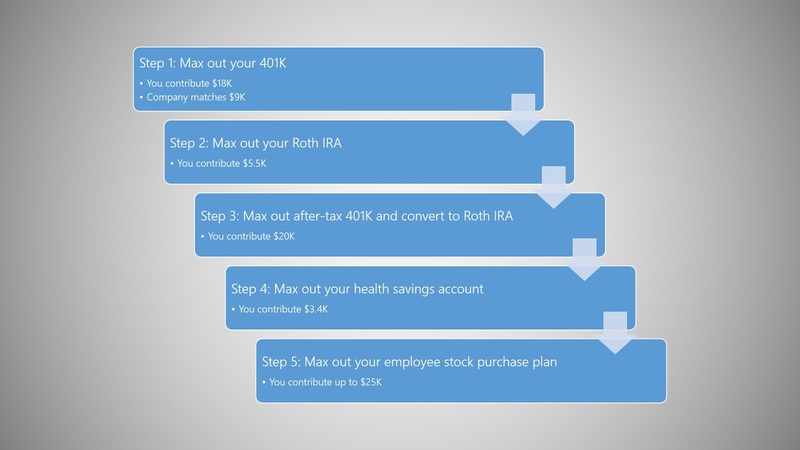 Once you’ve maxed out your Roth IRA, contribute $20K to your 401K after-tax. Once you max this out, roll it over to your Roth IRA. This allows you to funnel another $20K into a Roth IRA. Once in a Roth IRA, you never have to pay taxes on any of the gains. Once you max out your after-tax 401K contributions, contribute $3.4K to your health savings account. This is untaxed money that you can use towards healthcare expenses. Once you’re in your 60s, you can use this for healthcare, or anything else. If you decide to use the money for non-healthcare expenses, it’s just like a traditional IRA where you pay taxes on it when you withdraw. Many companies offer employees a stock purchase plan. This allows you to save another $25K or 15% of your income, and depending on the company, you’ll get an instant discount on company stock. My company offers a 10% discount on stock. I typically sell the company stock immediately after the offering period and invest it elsewhere. You can read this article on the merits of investing in an ESPP. Although an ESPP is not protected from taxes, the discount on stock is an immediate return. 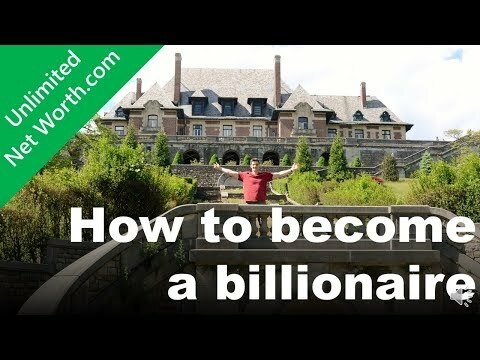 If you take advantage of all of these strategies, your net worth will skyrocket in no time. Now that you know what accounts to put your money into, where should you invest it? When to invest – can you time the market?